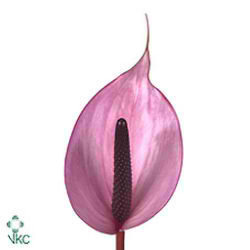 ANTHURIUM NEXIA are a Lilac/Purple variety. Wholesaled Batches of 16 stems stems per box. As with all tropical flowers Anthuriums prefer the warm, so do not refrigerate. Anthuriums, (otherwise known as The Flamingo Flower, Flamingo Lily, Boy Flower, Painted Tongue or Willies on Plates by some cheeky florists!! ), are a genus of the Arum family. Anthuriums are native to the tropical Americas and grow naturally in many forms, bushy or climbing with roots that can dangle from a rainforest canopy all the way to the floor!